Free NFL Picks Predictions Previews and Live Odds. Provided by expert professional handicappers. Staff researches and analyzes pro football games against the point spread. Betting tips include parlays, teasers, and over under totals. Proven methods and techniques are applied during handicapping process.Handicapping team has compiled several years in the sports advisory business. As a result, we have many satisfied clients.Bettors will have ample time to get their wagers in at their preferred destination. As a result, transact bets quickly. Rapid delivery of sports information. This is not a gambling site. But an information source for NFL pro football from a wagering angle. For betting legally on games.Visit our social media channels to gather valuable content in additional to website content. Social media readers observe strong presence of subscribers.Notably on Facebook, You Tube and on Twitter. 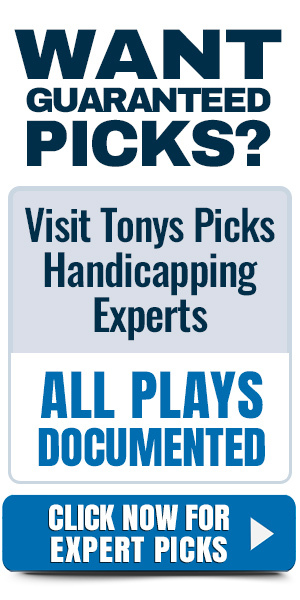 Search #TonysPicks. Please subscribe when visiting. Visitors find updated fresh content. Free picks everyday listed on our home page. Displayed is our content throughout social media platforms. Philadelphia Eagles vs. New Orleans Saints 1/13/2019 Picks Predictions Previews More NFL Picks Predictions Previews Philadelphia Eagles vs. New Orleans Saints Game Notes—Teams met nearly two months ago with the 48-7 home victory as a -7 betting odds favorite. Saints gained 548 yards on the Eagles defense. Drew Brees threw for 363 yards and four touchdowns. Carson Went had 156 yards passing with three interceptions. Philadelphia enters the Divisional playoffs after the 16-15 road win in the Wildcard round to the Chicago Bears as a +6.5 betting odds underdog. Win streak is now four straight with Nick Foles at quarterback…. LA Chargers vs. New England Patriots 1/13/2019 Picks Predictions Previews More NFL Picks Predictions Previews LA Chargers vs. New England Patriots Game Notes—Teams met last year with New England earning the 21-13 home victory as a -6.5 betting odds favorite. New England moved the football for 414 yards throwing for 317 yards and a touchdown. LA had 349 yards of offense rushing for 157. Melvin Gordon ran for 132 yards and a touchdown. LA Chargers advanced to the Divisional playoffs following the 23-17 road win at Baltimore Ravens as a +3 betting odds underdog. Team has won eight of ten….